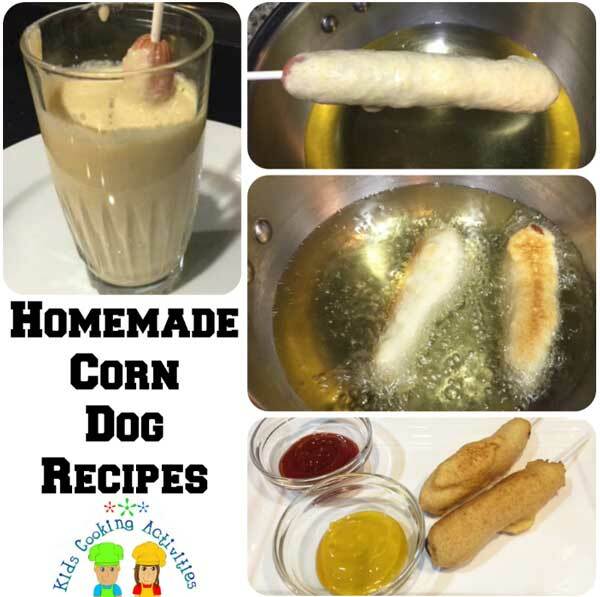 We've included two corn dog recipes on this page. One is a traditional fried version and the other is a mix between a hot dog roll up and a corn dog which is baked in the oven. Using a tall measuring cup or glass will make it easier to dip your hot dog into the mixture and coat the hot dog. If it is easier you can mix it in a bowl and then pour the batter into a tall container. You can also cut your hot dogs in half and it will be easier to coat the whole hot dog and you will easily have a mini corn dog recipe. Combine cornmeal, flour and egg. Blend together until mixed well. Slowly stir in milk until your batter thickens. Let stand a few minutes while you heat up the oil in a frying pan or deep fat fryer. Heat oil to 375 degrees. Dip hot dog in batter coating all sides some batter may drip down that is okay too. Fry until golden brown. Drain on a paper towel. Any leftover batter can be fried for eating, these are called hush puppies. In a mixing bowl, blend cornmeal, flour, baking powder, salt and sugar together. Blend in butter, egg and milk and mix well until your batter forms a ball of dough. 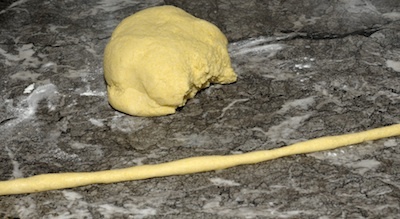 Take a piece of your dough and roll into long ropes. Cut 8 hot dogs in half and set all but one aside. 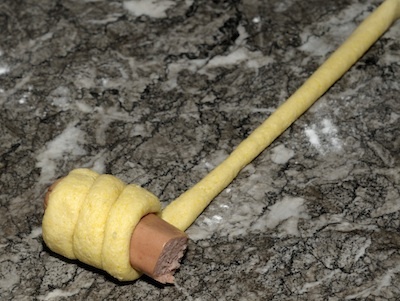 Slowly roll hot dog into the rope as shown. 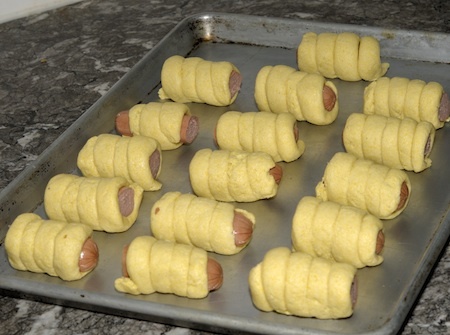 Continue with remaining hot dogs and place each on a cookie sheet. Bake in a 400 degree oven for 10-15 minutes or until dough is lightly browned.